Cook and drain pasta as directed on box. Place pasta in large bowl; cover. In 10-inch skillet, heat reserved artichoke marinade over medium-high heat. Cook and stir artichokes and mushrooms in marinade 2 minutes. Add to pasta, along with roasted peppers, cheese, salt and pepper; toss well. Cover and refrigerate until well chilled, about 1 hour. Spoon pasta mixture onto large serving platter. Top with nuts and fresh basil. 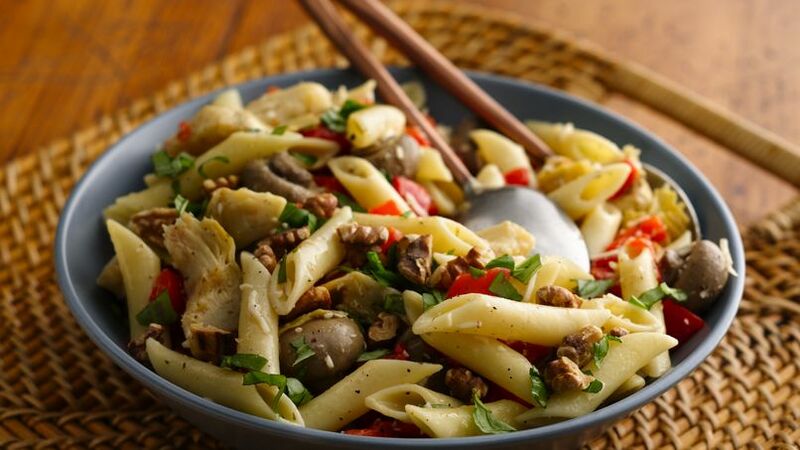 Enjoy this delicious salad made using pasta, Progresso® artichoke hearts and mushrooms – a perfect side dish!